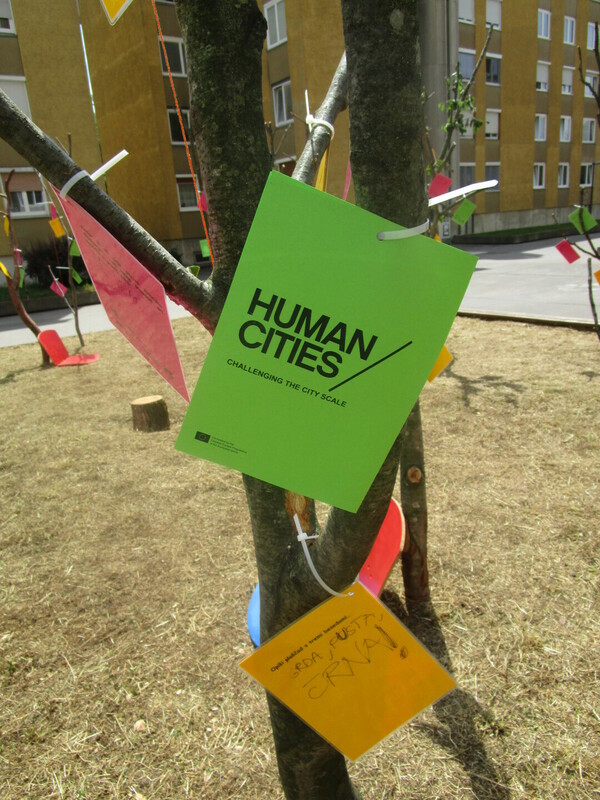 The first co-creation briefing of Human Cities-Challenging the city scale took place on the 18th and 19th of June 2015 in Ljubljana. This was an occasion for the Human Cities Ljubljana team to meet the local community of Bratovševa ploščad, the neighborhood in northern Ljubjana where the experimentation process is taking place. Thanks to Alice Holmberg, an external expert working with Human Cities, discussions and activities were constructive, offering some concrete definitions of the issues and dreams of the local community for the future of their local public spaces. The aim of the first day of a meeting was to gather locals living in the neighborhood to discover the neighborhood and its public spaces through their eyes. To do so, a tour around the neighborhood was organized with already engaged citizens. Damjana Zaviršek, creator of Skupaj na ploščad, an initiative aiming in offering new opportunities and ideas for the central paved area in Bratovševa ploščad (called “ploščad” by locals, which means a “platform” ), opened and moderated the walk. During the walk the local inhabitants as well as institutionalized stakeholders explained the issues related to concrete public spaces in the neighborhood and presented already existing facilities and assets. The issues of the renovation of the underground parking under the central paved area, the lack of events and regular uses of the central area, the already existing activities in the neighborhood (basketball fields, bar, park and urban allotment gardens) were pointed out in the discussions along the walk. This offered a great opportunity to start an asset mapping for the experimentation process. After the tour, a communal picnic took place in the central open space of the neighborhood. An event on the spot was an opportunity to get in touch with even larger local public and to tackle the engagement processes going on in the neighborhood. Some participation tools were used on the spot to permit an active engagement of passers-by too: written feedbacks on notes on the artificial trees, a model of the space to understand the wishes/needs of the users of the space and interviews of the locals were performed. The event proved to be a success – many locals joined on a nice summer afternoon and shared their visions of the space. “Thanks to the event, I have now a new perspective about the renovation process needed to make public space of Bratovševa ploščad a better place – it is clearer now what are the main obstacles for the renovation process to happen. We’ve met a lot of inhabitants and get the opportunity to talk with them about their visions of the future of open public space in the neighborhood”, Damjana Zaviršek, creator of Skupaj na ploščad, happily reported after the event. Another remark was made by Matej Nikšič, researcher at UIRS, who observed that reinventing a suburban neighborhood and its public space with active participation was not an impossible mission. “The case of reinvented public space in Ljubljana city centre shows that public life can be truly thriving in this city. It was nice to see the same going on in a suburban Bratovševa ploščad for a while! The challenge stays however how to achieve this more often and on daily bases – Ljubljana’s suburban neighborhoods must not be merely sleeping units of the city”. The gathering with locals led to some other interesting observations and conclusions. If you want to attract people to the community events, a good idea is to attract children as this will sooner or later bring their parents too. Children are the first ones to check the novelties in the public space, they are neither afraid nor skeptical to take part and try any new installation that was added to the urban public space. Nevertheless without a moderation they are less incline to participate in expressing their opinion. Talks and explanations are needed to attract them which makes a process more complex. Making them participate in the future of experimentation in Bratovševa ploščad will be a challenging task. During the second day, the most active locals and the co-organising teams of UIRS and Skupaj na ploščad met in a focus group. An around the table meeting was set up to make a common vision of the experimentation process that shall contribute to the improved central paved space of the neighborhood. Alice Holmberg was leading the discussions this time with her knowledge and experience in moderation. Alice’s method was quite innovative for the inhabitants of the neighborhood. Thanks to a system of declaration of interests, she succeeded in making people talk about their wishes and dreams for the future of the place. For a moment burning issues were put away to focus on a positive-thinking process. Doing so, citizens thought about new ideas at the same time as pointing at what is missing in the neighborhood. During the meeting the visions of inhabitants lead the Ljubljana Human Cities team to clearly identify several social issues and needs related to the local public space. The discussion revealed the need to re-focus the pre-existing debates (that have been going on in the local community for some time already) from technical repair and other technicalities to social life and local identity improvements.The need of inclusiveness in the future of the project as well as developing an intergenerational community and a human scale neighborhood were pointed out too. Observations from the public picnic and declarations from the focus group meeting were matching: the platform needs a defined role and identity in the future to become an urban public space that people will use. Nowadays the platform is merely a transition space, in the future inhabitants truly wish the platform to become The Place. To finish the co-creation session properly, Alice Holmberg and the Ljubljana Human Cities team gathered once more to explore the future options and start the elaboration of the experimentation agenda that will happen in the next two years. The two-day event helped Ljubljana team to understand and have a clearer picture of the issues in the neighborhood, the wishes of the local community and the expectations of some stakeholders. Last but not least: we are taking this opportunity to thank our intern Lucile Fauviaux, who stayed with us in Ljubljana during the initial phases of Human Cities project and finished her active involvement with Bratovševa ploščad event. Her out of the box and at the same time well-structured thinking was a true contribution to the processes. We are glad that the internship turned out to be useful to Lucile too. “These two days where the occasion for me to observe the participation process in the neighborhood, to identify who is participating and who is not. Meeting locals and understanding how to make them talk about their wishes gave me an interesting insight into the work related to urban regeneration. It was a nice experience”, reported Lucile after the Bratovševa ploščad gatherings.